Arabic Fruit and Vegetable Shop Dialogue! Our home schooled students had great fun acting out a shop dialogue and making smoothies! This term our home schooled students have been learning key Arabic vocabulary and phrases used in shops. 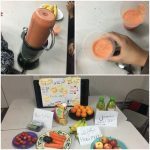 They put their learning into practice by acting out the dialogue of buying fruit and vegetables, as well as making delicious smoothies to sell in their shop. Students were able to speak fluently asking for prices of the produce, how much they wanted to buy and identified the names of a variety of fruit and vegetables. Students conversed fantastically with each other, which highlighted the excellent progression that has been made this term.